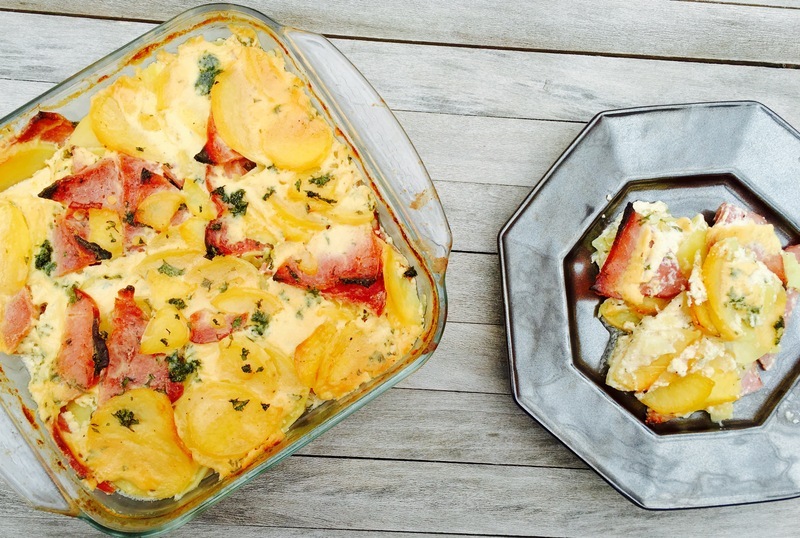 Scalloped potatoes are a classic comfort food that is both rich and simple. In this recipe, we added a mixture of sweet potatoes and yellow potatoes (we used a ratio of about 2/3 sweet potato to 1/3 yellow potato) to change the flavor. With a pound of Petit Jean hickory smoked ham, this dish is hearty enough to stand alone, and is perfect to use up any leftover ham from a holiday! 1 pound hickory smoked Petit Jean ham, cut into bite-sized pieces. Preheat the oven to 350 degrees Fahrenheit. Butter a 9x9 baking dish and set aside. Peel and cut potatoes into ⅛” slices. In a large saucepan, combine potatoes, vegetable stock, half-and-half, garlic, salt, pepper, mustard, nutmeg, and white wine. Bring to a boil, then reduce heat to medium-high. Cook, stirring occasionally, for approximately ten minutes, until the mixture has thickened. Remove from heat and stir in Petit Jean ham and 2 tablespoons of the fresh parsley. Transfer the mixture to the baking dish. Bake, uncovered, for about one hour, until lightly browned on top. Remove from oven and let cool for about ten minutes before serving. Sprinkle remaining fresh parsley on top just prior to serving.